Free Shipping Included! Terra Verde Home 3 Tiered Wood Garden Planter, Natural by Terra Verde at Tulips Orchids. MPN: JFA16010. Hurry! Limited time offer. Offer valid only while supplies last. Set the tone to your patio decor. This beautiful 3-tiered wood garden planter allows multi-level planting. Easy assembly with pre-drilled holes. Set the tone to your patio decor. 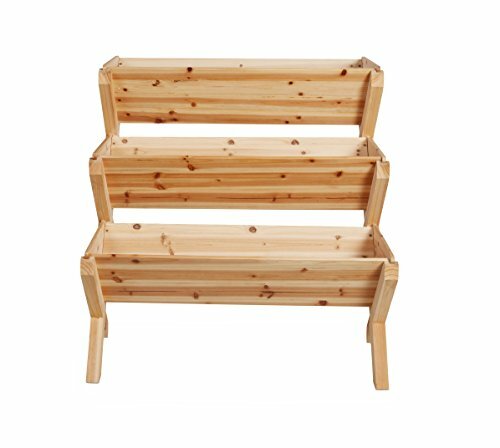 This beautiful 3-tiered wood garden planter allows multi-level planting. Easy assembly with pre-drilled holes. Constructed in 100% fir wood. If you have any questions about this product by Terra Verde, contact us by completing and submitting the form below. If you are looking for a specif part number, please include it with your message. Greenes Fence Cedar Raised Garden Kit 4 Ft. X 8 Ft. X 14 In.